Love riding your bike but don’t know where it should be put after racing? People commonly leave their bike in their corner of garage, hallway, or even just in outside. Yes, it’s true that building the bike storage is always challenging. Bike rack is the best solution rather than a sloppy pile in your garage, that’s why it’s crucial for you guys to check these ideas of creative bike rack. 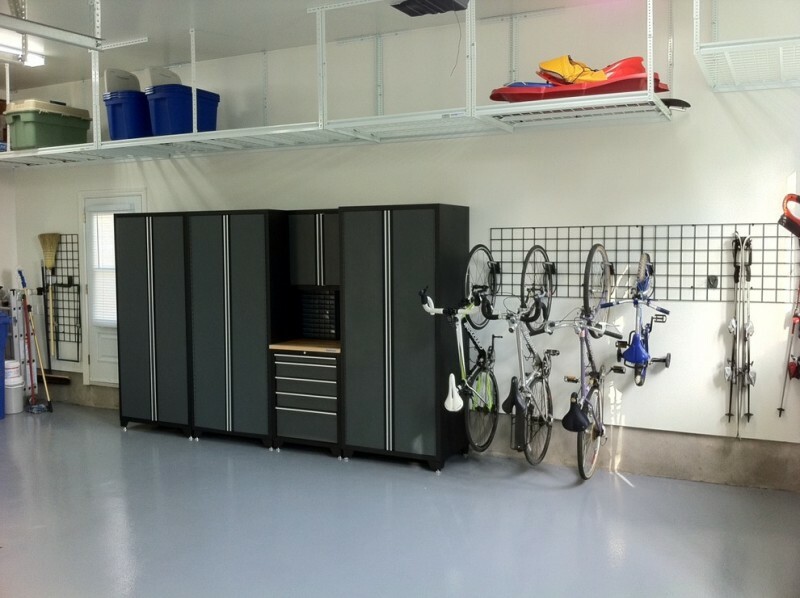 These ideas probably can solve your biggest matter of bike storage. 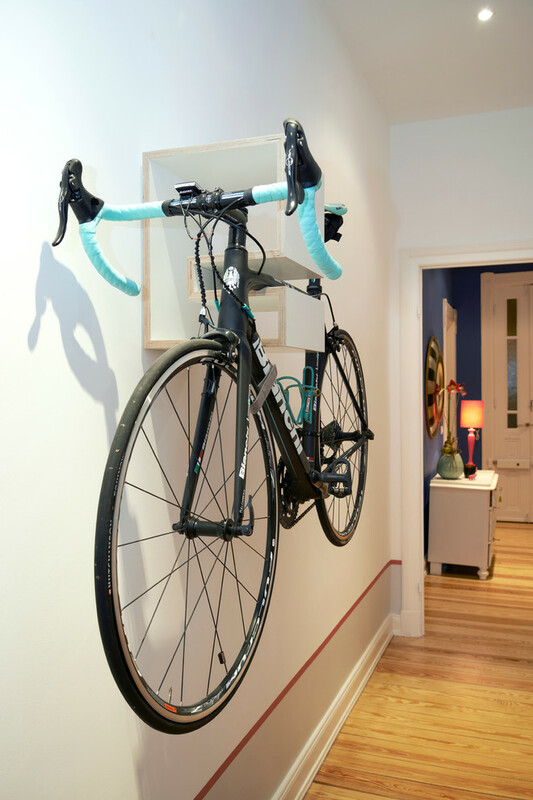 This racing bike is simply mounted on the wall. It’s really unique as it offers a new look in pleasing way. The mounted racing bike is also gonna be a additional wall art when it isn’t used. You probably can add a bunch of lightbulbs that casually beautifies the room’s center. 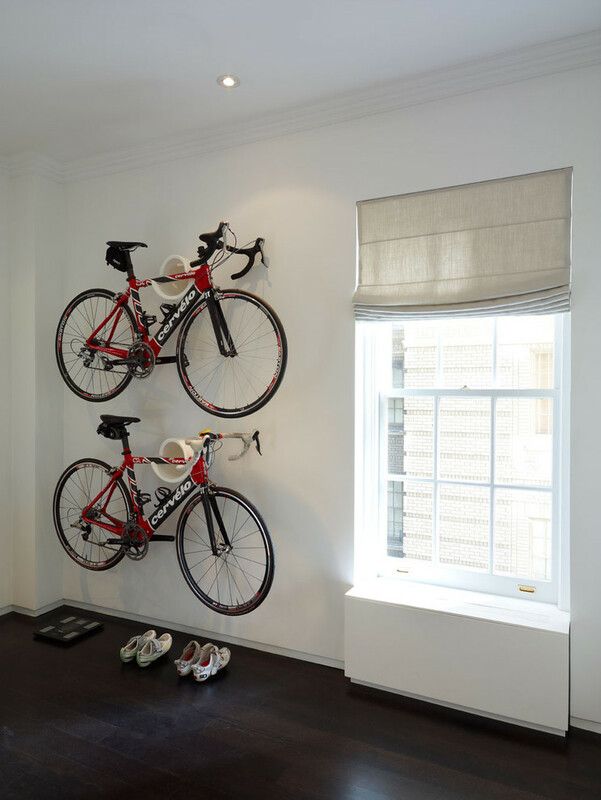 Fitness room is a perfect spot to store your racing bike collections. 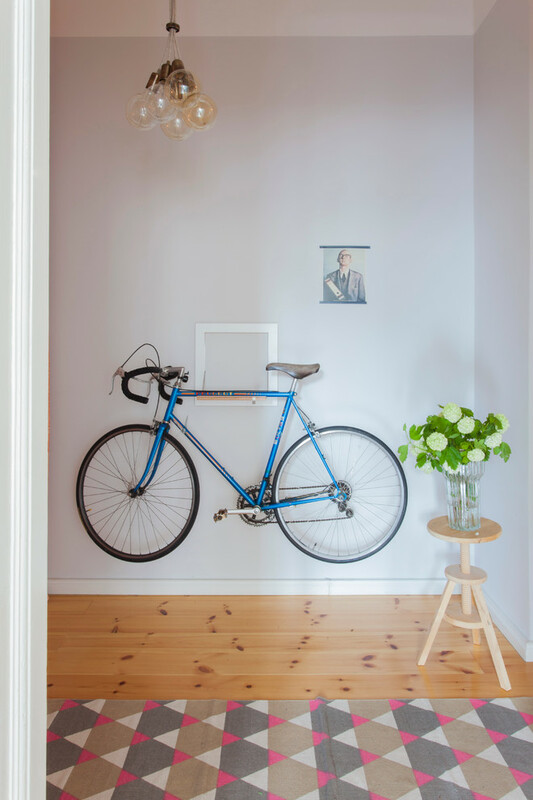 You can put your favorite bike on single wood board mounted on walls. Place it side by side with the bike’s spare-parts as the decorations. Keep the wood board is in original tone for a beautiful contrast. 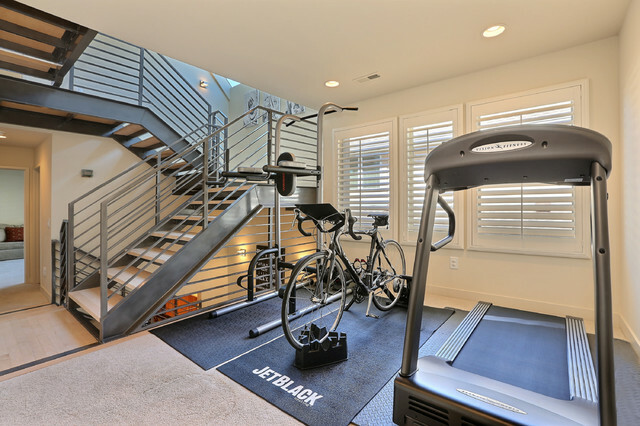 Optimize unused space under staircase for bike collections. Put a kickstand on the floors and stand your bike up on it. Also, say many thanks to craft maker who have created such a unique bike hangers. 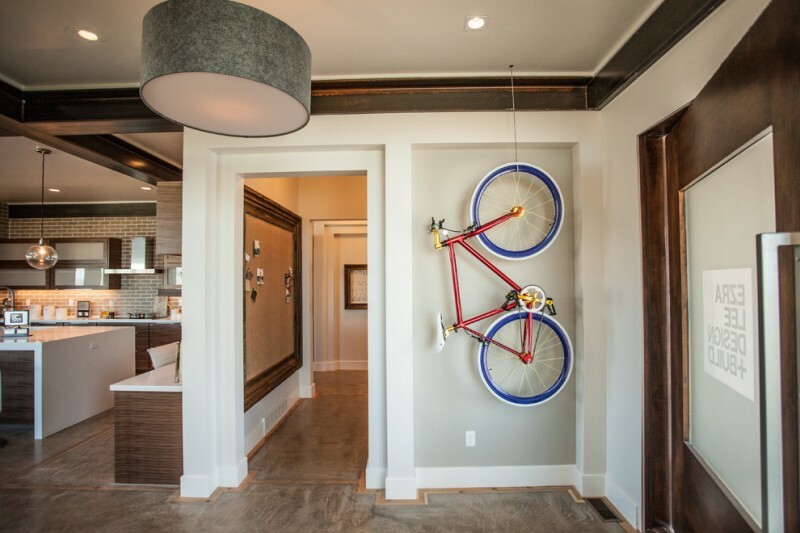 With these hangers, you can mount the other bikes steadily on your walls. 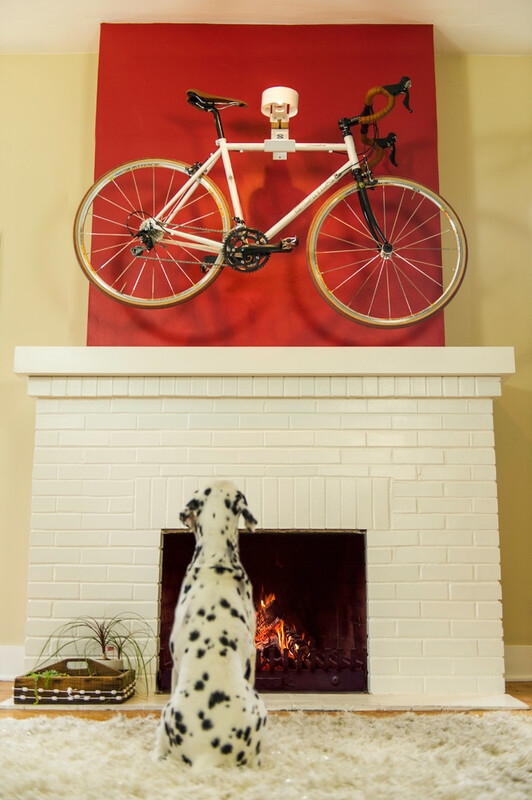 Make your bike collection as just an ornament. 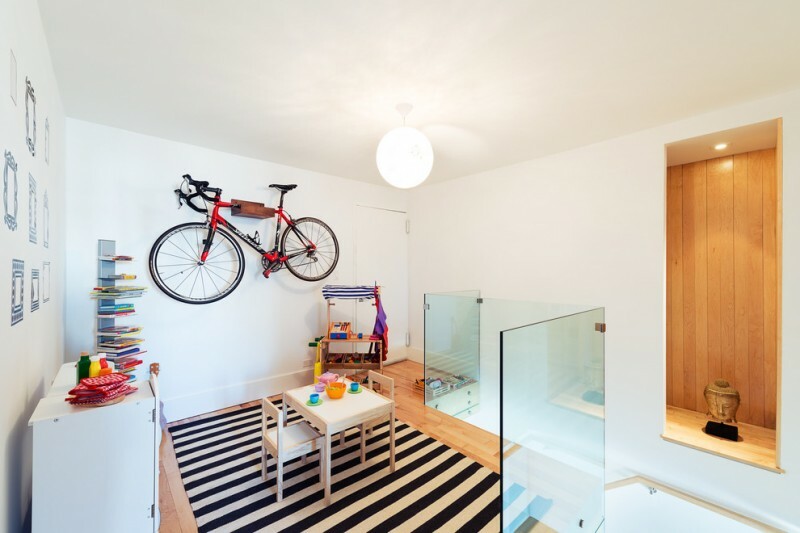 In this idea, the hanging bike is originally used as the wall ornament. Put such a unique and creative ornament in your private room like home office. Feature this ornamental bike with similar toned furnishing sets. An ornate wall-mounted racing bike in a kid’s playground. The concept is unique to apply in such room. The colorful interior things are still being highlighted with such a fabulous ornamental bike. If you like storing your bike in your garage, create such a unique and practical tool. The bikes are hung on a metal bars which are powerfully supported by the metal wires. 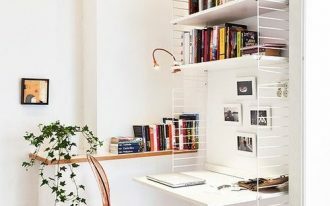 This idea is space-efficient and aesthetically great! 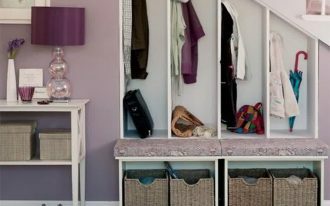 Slat walls evidently help the big items well-organized. Buy best hookers to grab the sport equipment, gardening tool, and racing bike collections in their proper storage. This idea is always recommended as all things needed here are easy to find and to access. Create your own sport storage system by adapting this idea. 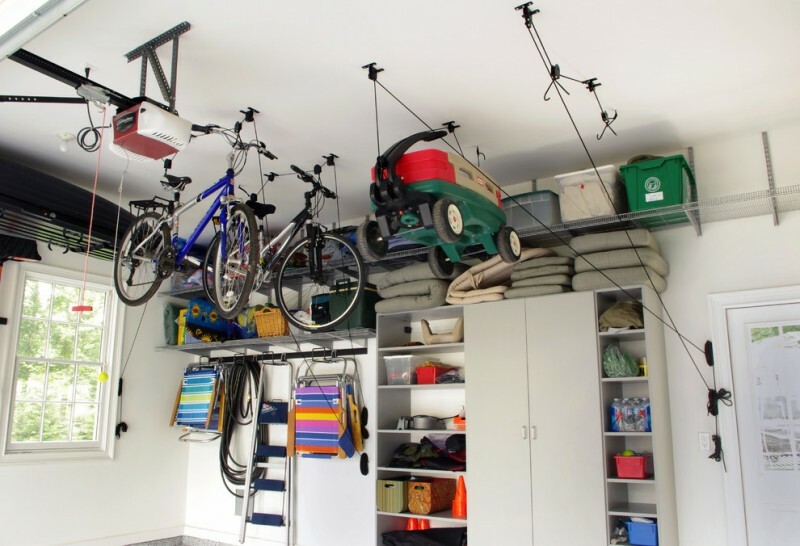 This simple idea just needs the hooks for mounting all your sport equipment on your shed or garage. 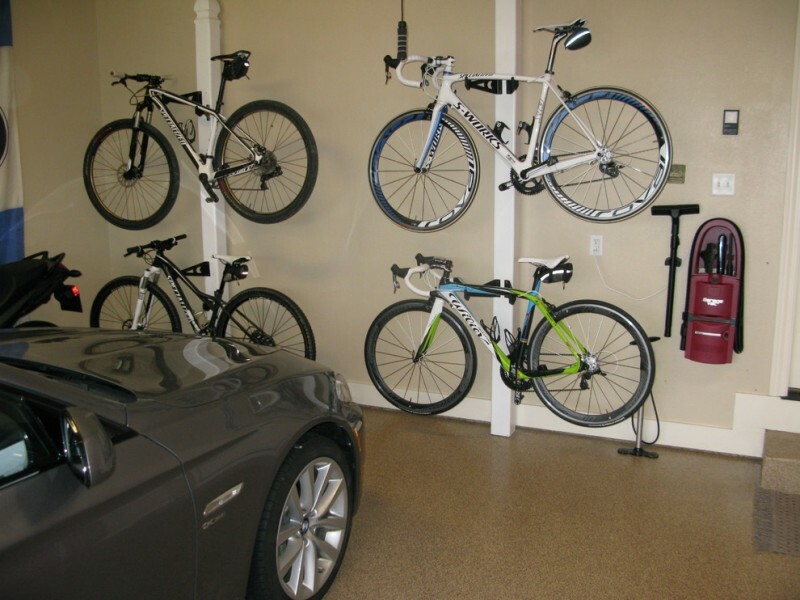 Keep all sport equipment, including your favorite racing bikes, in proper place like this. The well-organized items, of course, will be a direct interest for everyone passing by. It seems like a sport display actually. 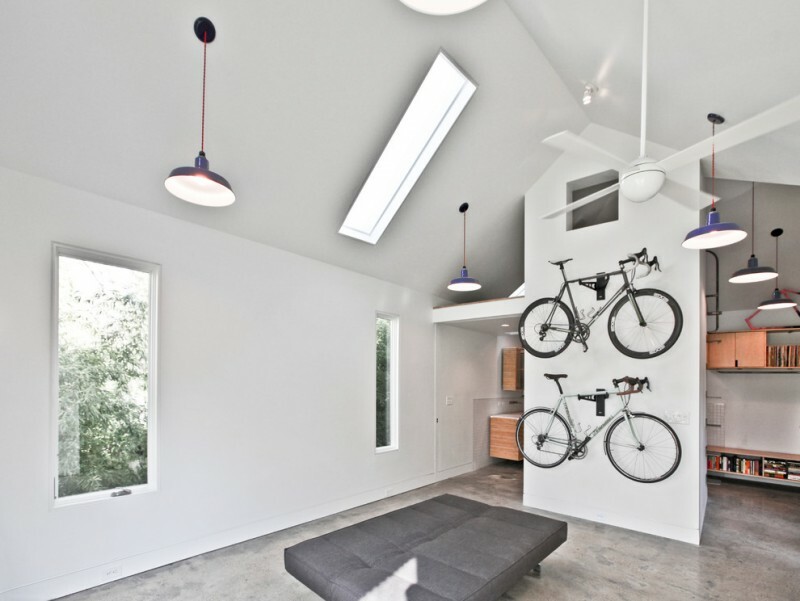 Actually, this is a special project of vertical bike hook where you can hang your bikes up on walls. 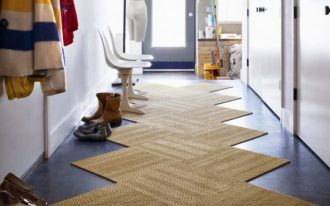 The idea is really advantageous for making valuable and free-used floor space. The installation features modern style silver storage units and variants of shelves, bins, and hooks for a huge storage idea. 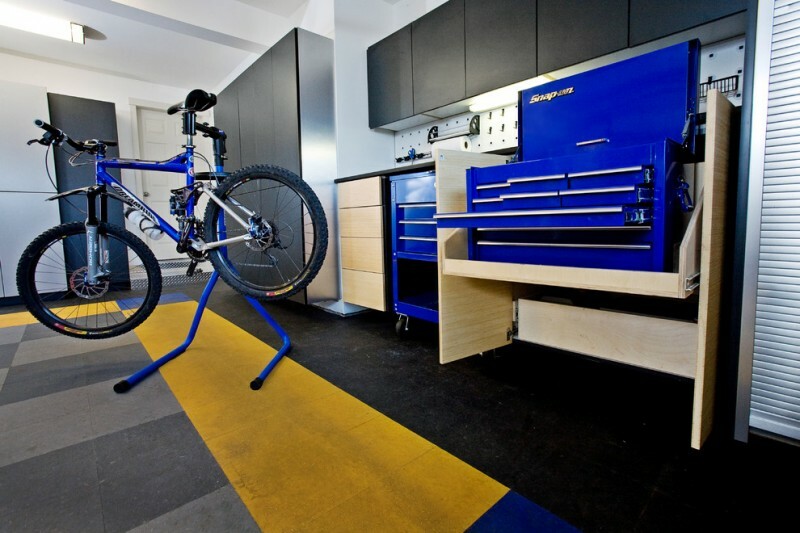 Make your racing bikes and other items well-organized and free the floors off to optimize the floor space availability. 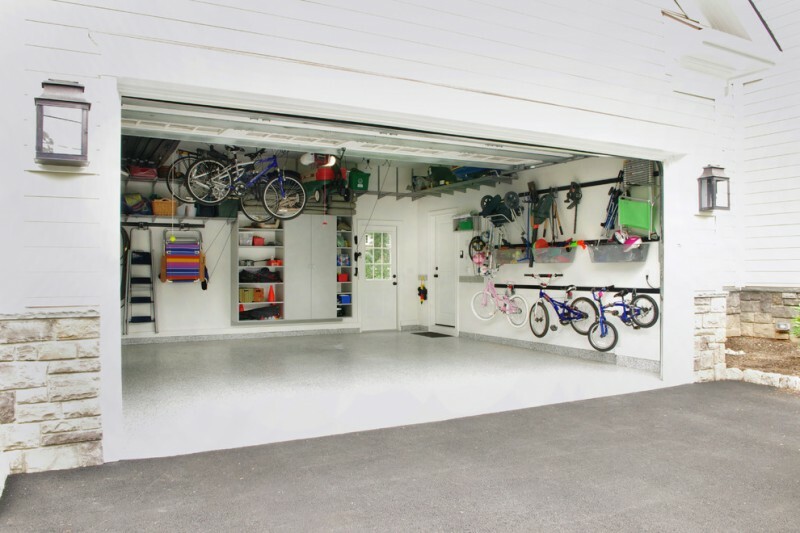 Create clean and airy garage space with adapting this idea. Fill the white walls with metal cabinets, hooks, and bins for a maximum storage solution and make your floor space free from the things. With this idea, you can use your valuable & free-space floors for a park area. 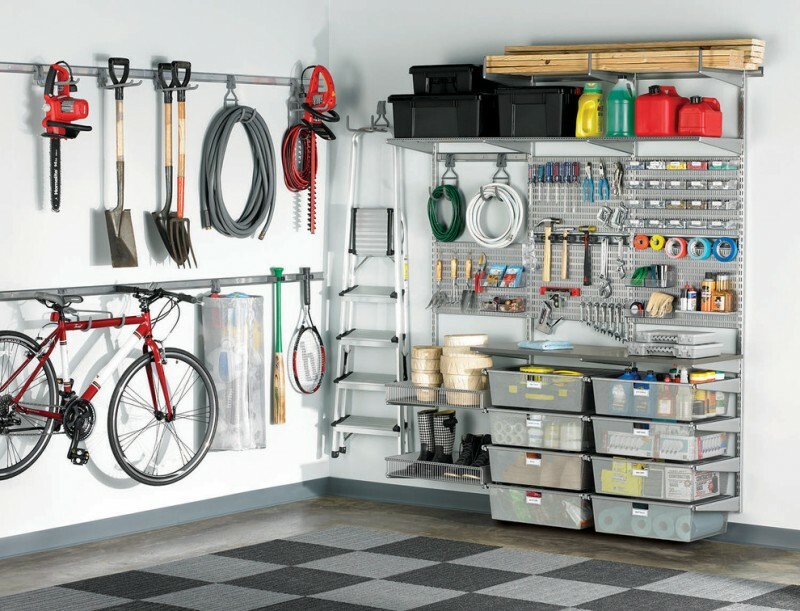 What a simple garage storage! The space consists of floating silver cabinets and metal hook panelings for bike, gardening tool, and sport equipment. This idea is the best choice for a limited-space garage. 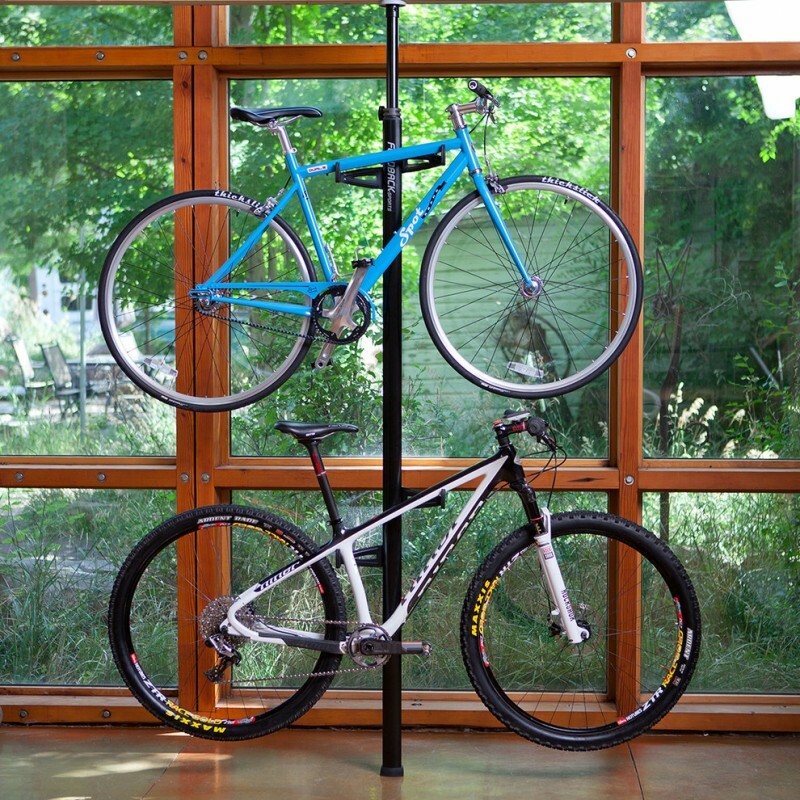 Complement your shed with such a marvelous bike racks. The racks are available for any sizes and any types of bikes. You just install them side by side with the cabinets or other kinds of storage unit. This idea actually helps you keeping your things properly. 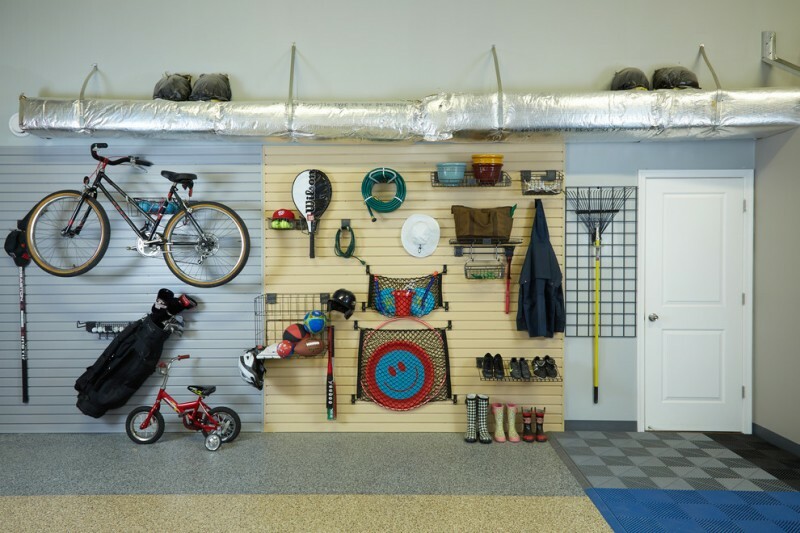 Most sheds and garages have large unused wall space. 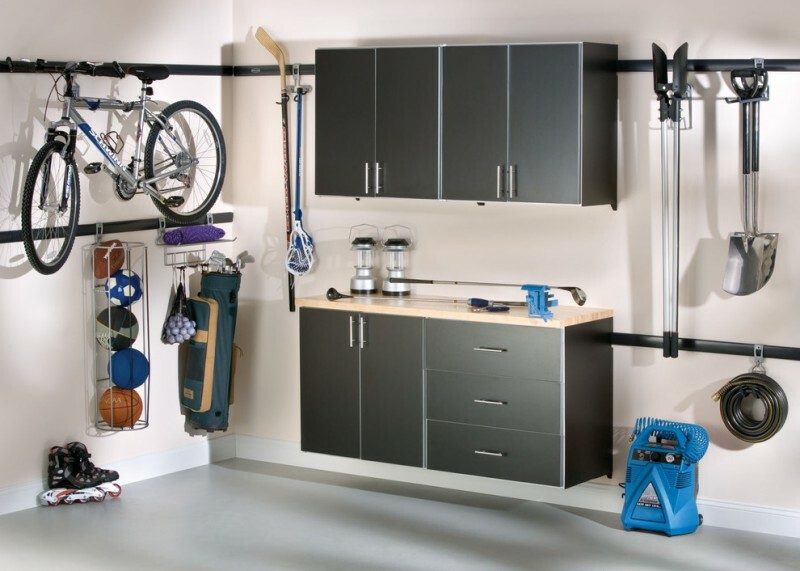 Make it optimal by installing the hooks for a maximum wall storage solution. Select flexible and durable hooks and racks for keeping your racing bikes and unused things properly. Make your walls more precious than before. With such durable and strong bins, hooks, and racks, the walls can fit customized storage requirement. 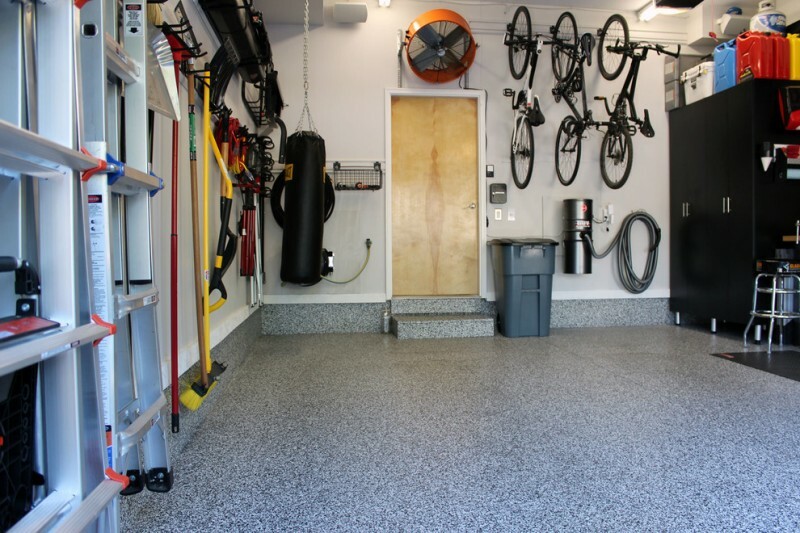 Just create a special space for saving and organizing your bike, gardening tool, and other unused items, and you will never waste your times for seeking what you need. If the floor is more premium, put all storage units up and create the overhead storage systems for saving the unused items there. Hanging bike rack, for instance, is the safest way to keep your bike. You can use the pulley system or powerful rope for hanging or lifting the bike up. You can raise or low the bike easily when needed. Don’t forget to equip your bike rack with locked mechanism for a security that can prevent the accidents. 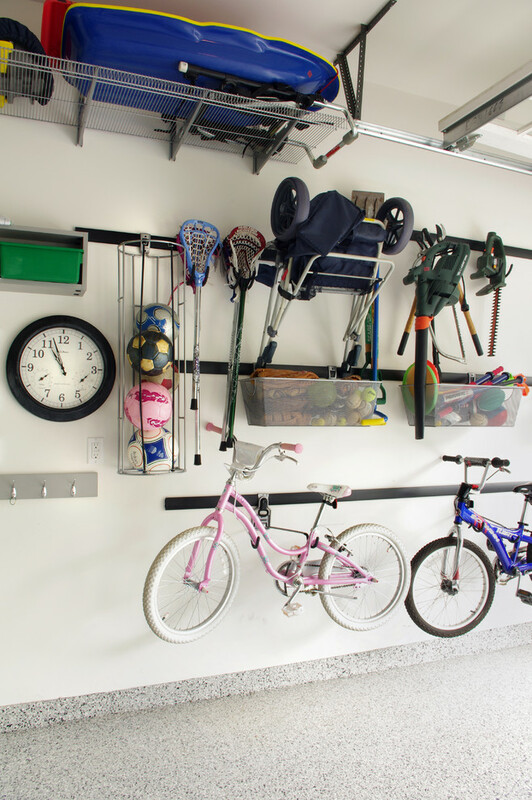 This opened garage looks like a display of sporting or gardening equipment. 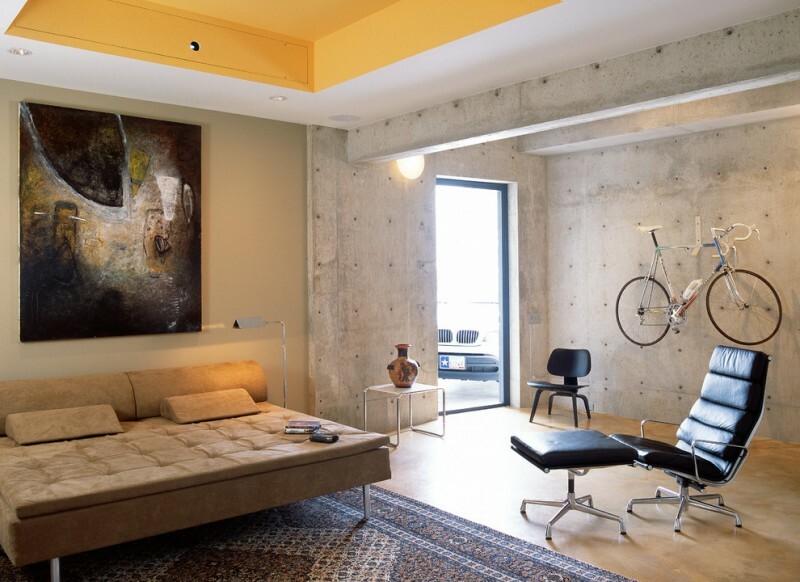 All items are well-organized on walls, and the floor space fills nothing, a good space for car and motorbike parking area. 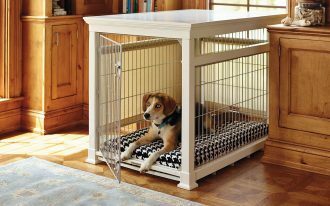 It’s good idea to create such a practical and space-efficient storage solution. 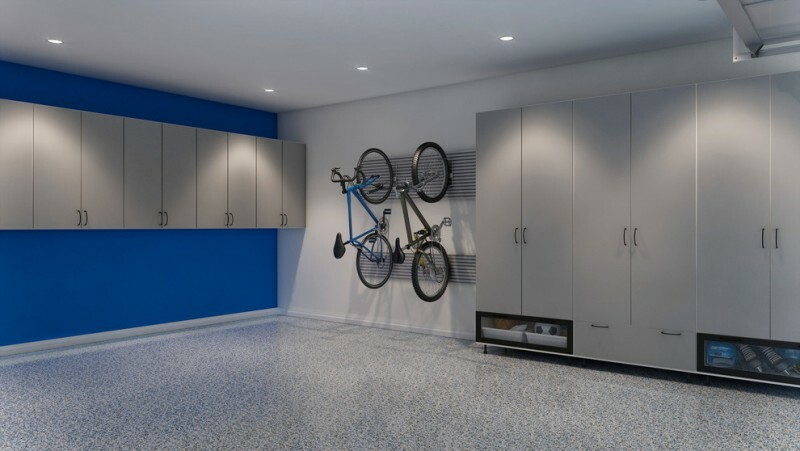 There are two kinds of tools used for storage solution: floating racks for shoes and hooks for bikes, travel cases, and sport essentials. A couple of light metal baskets also complements the shed. 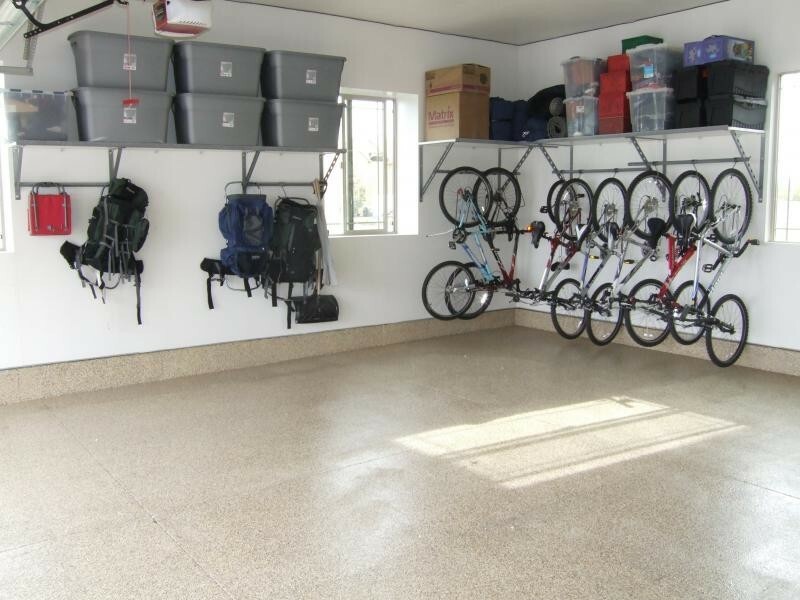 This transitional garage looks well-organized with wall-mounted bike racks, bins, and hooks. Look at the floor space, it’s larger since there’s nothing left to store. The space looks larger with grey epoxy coating floors. If you want to save much space for storage, it’s recommended to pick this idea up. Use the walls for storage solutions by installing huge varieties of storage units such as ventilated baskets & shelves for sporting and camping equipment, drawers for smaller items, and holders & hooks for items which is hard to store up from floors. The utility board here is designed for hardware and hand tools. What a complete storage option! 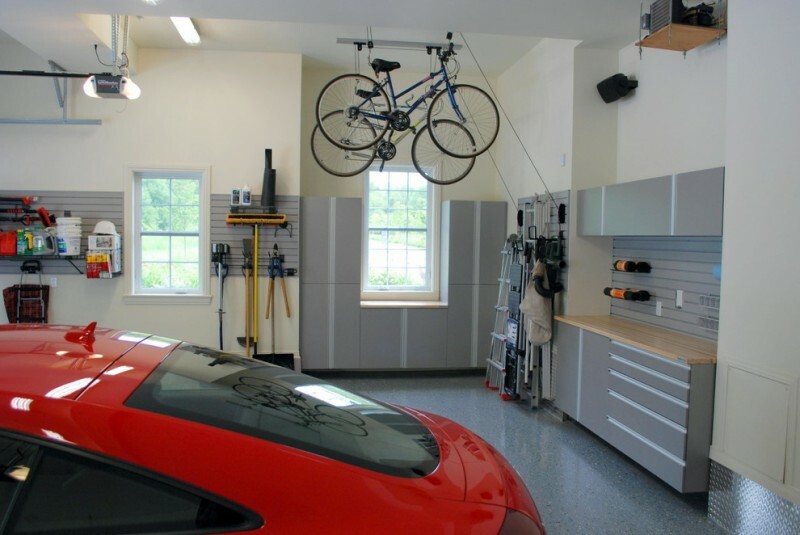 This is an idea of contemporary shed and garage supported with multi-choices of wall-mounted storage solutions. The storage units are mounted orderly on walls, letting the floors free from things and just expose multicolored epoxy coating floors. 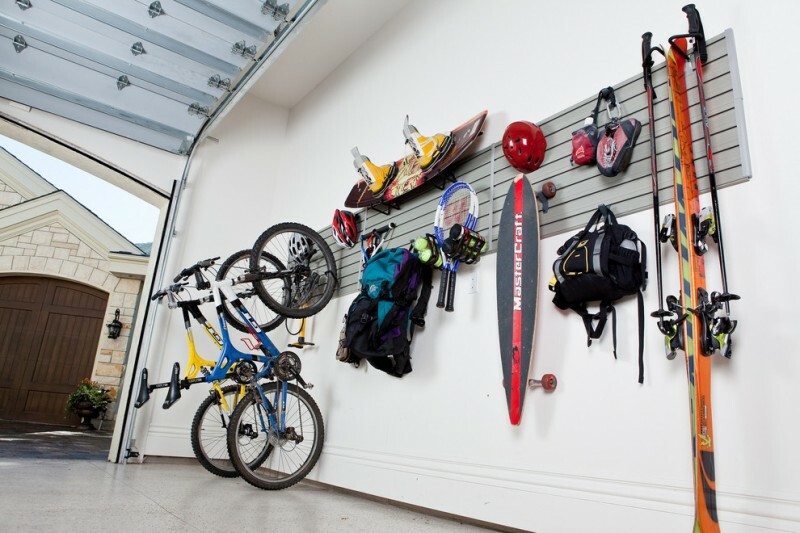 This is garage storage idea consisting of big wall shelf for containers, holders for camping bags, and wall bike racks. The floors seems larger for park area. 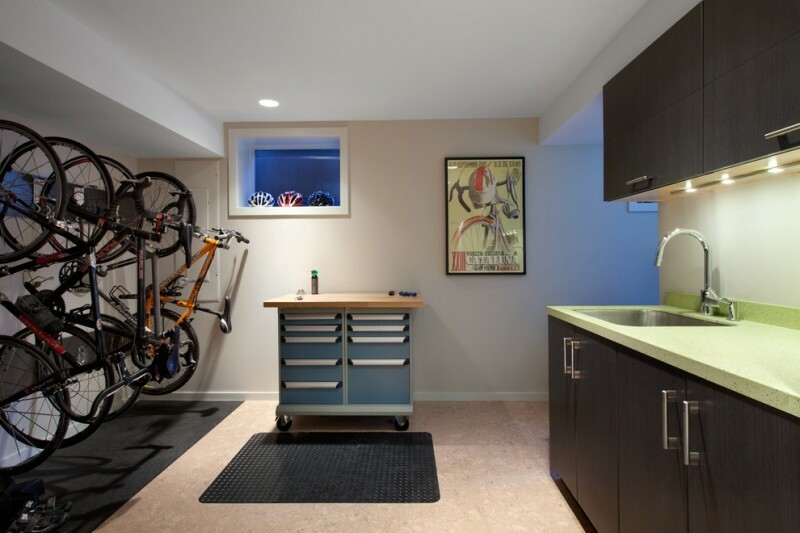 A basement kitchen integrated with wall bike racks. The space is designed as a multi-functional use; and one of them is to organize and to display the racing bike collections. It’s interesting and can be an inspiration for you guys loving bike race so much. 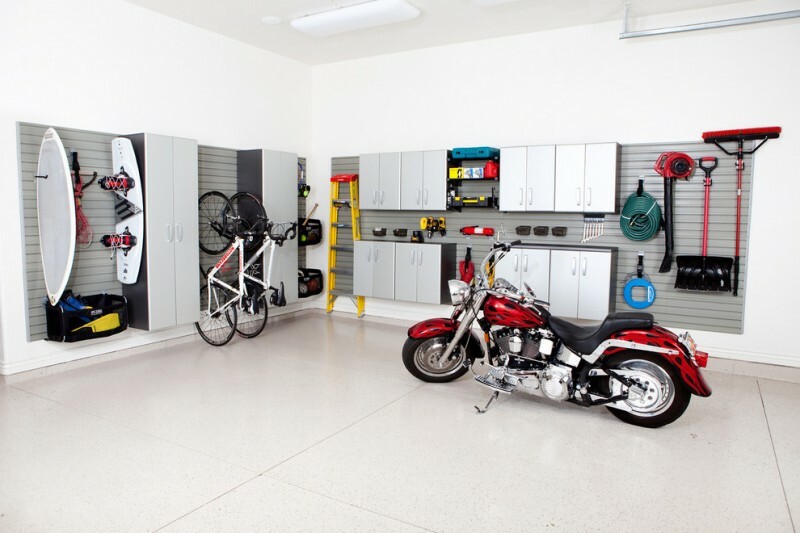 Clean and modern garage idea with lifted bike storage. The color choice reflects highest modernity. 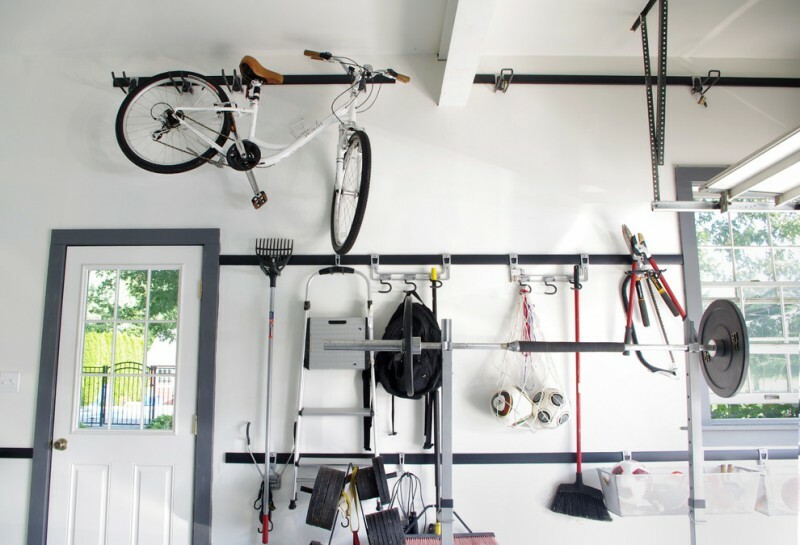 Several slat-wall storage and wall-mounted garage vac are installed to hang bikes and other hard-to-save things up properly. This idea helps us to keep being clean and easy-access. 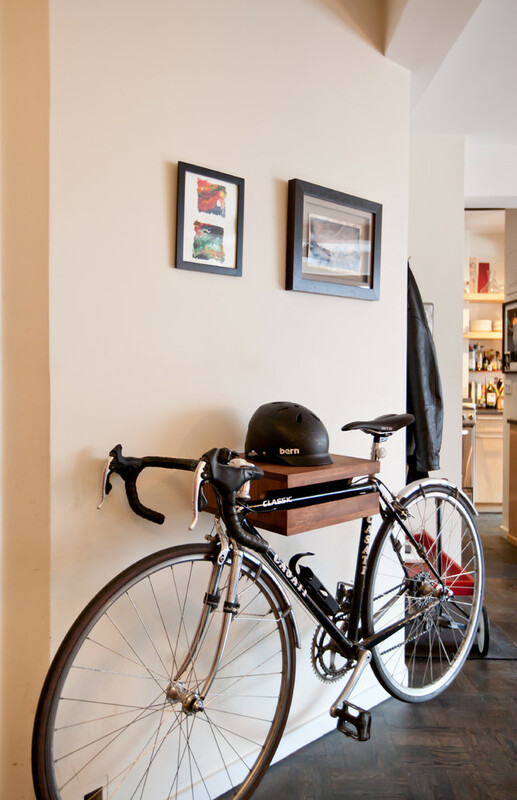 Wall-mounted bike racks become wall ornaments as well as storage idea in this space. And the color choice, additionally, keep attractive and quite modern. It’s unique! With just wood holder, you can hang your racing bike on it. Use the surface for putting your helmet. What such a practical idea! Still about the entry hall and wall-mounted bike rack. 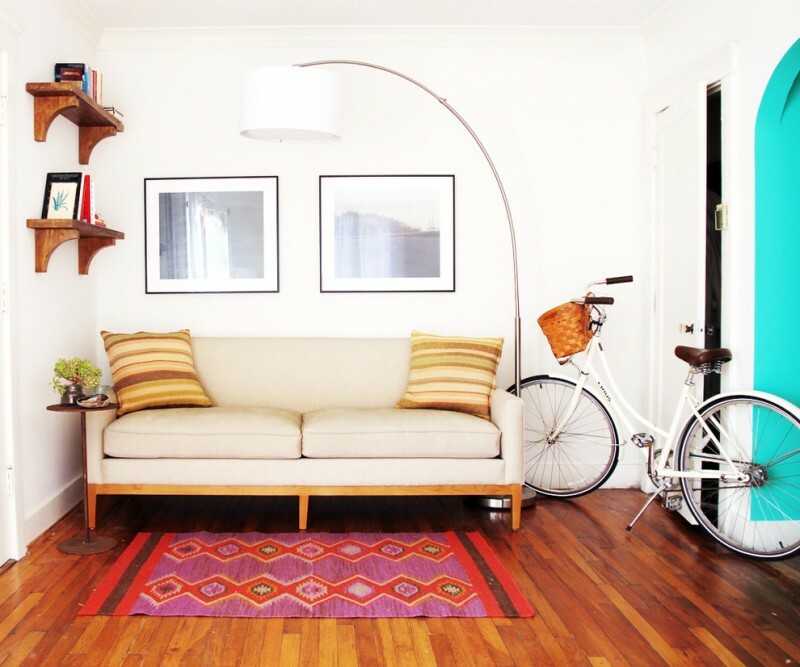 This wall bike shelf is bigger than previous idea and it looks more modern in design and color choice. The vacant space within the shelf can be used for smaller things or even books. Quite attractive and creative. What such a stunning bike rack! Actually, this is just a decorative bike that has been hung vertically on ceiling. The color contrasts against the white wall background, creating a stunning focal point in space’s corner. Create creative garnish for your entry way with such a amazing bike rack. The rack isn’t only an ornament, but also a functional item in which you can keep and organize your racing bike on it after the race. 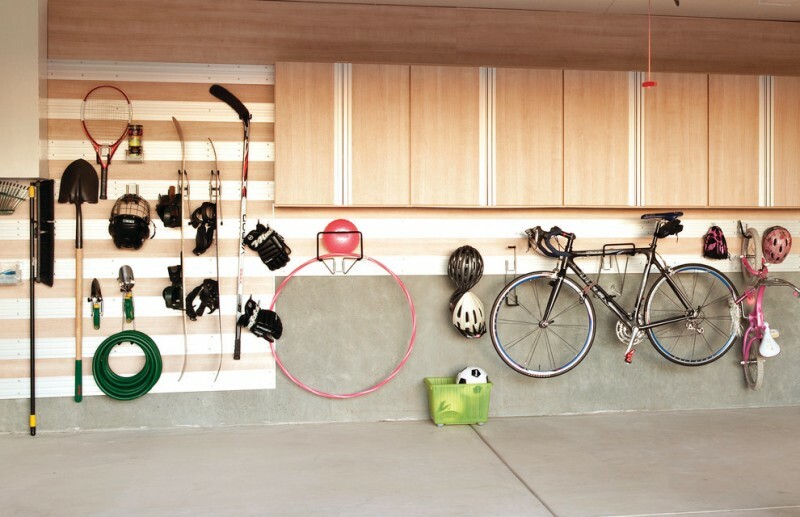 A well-positioned wall bike rack – this idea of bike rack is easy to adopt and you can build your own unit with using the hardwood boards as the main material. Mount the boards on your entry wall and put the holders or hooks on it. These hooks/ holders are used for hanging your bikes on. To make the bikes steady, use the kickstand that’s able to hold and to grab the bikes’ back wheel strongly, so they can’t fall down easily. An exposed bike rack in vertical position. Why in the corner and why in the entry way? The main reason is to make us easier to take and put back the bike after race. 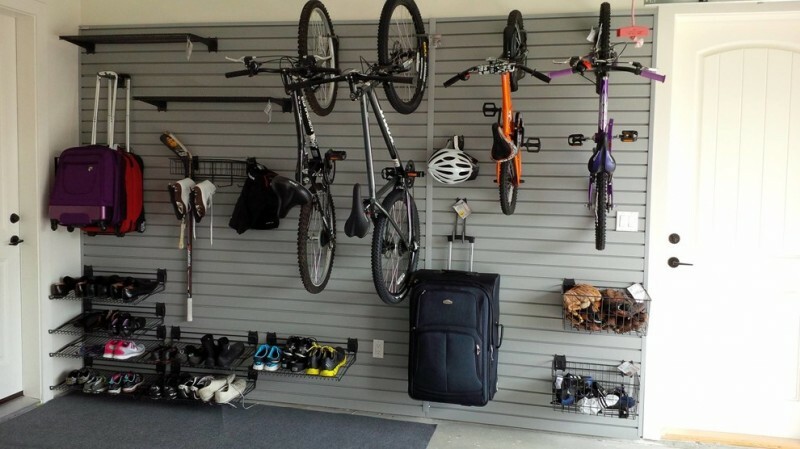 This space is the best spot for installing such a practical wall bike rack, and vertical is ideal to save space and to get the best aesthetic look. 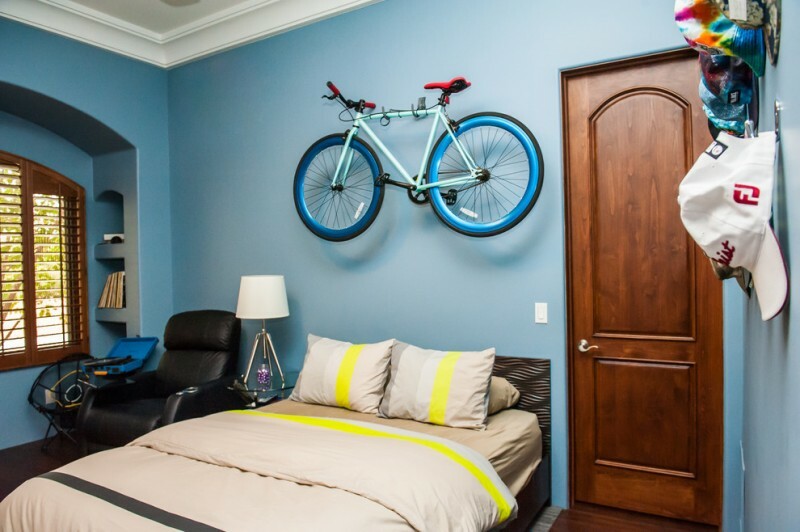 Urban-style bedroom idea garnished with wall bike rack. The rack is visible and it’s just like a bike floating behind the wall. It’s also a great concept to expose raw concrete walls as the rack’s background. Two columns of bike racks idea – Actually this kind of bike holder optionally can accommodate 4 units of bike without adding other elements. It can also be installed in anywhere we want. It’s optional now where we should keep and display our favorite ride. This is just an ornament. The gold-toned bike ornament gracefully accents the walls, creating an elegant contrast against the purely white background. Red brick walls, another wall panel, also give a contrasting color tone in this living room. Yellow chairs, at final, make the space really stand out. 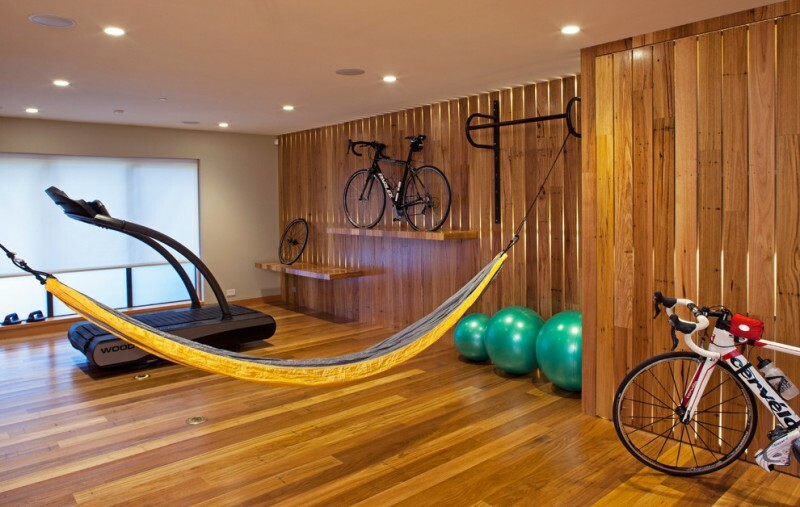 Another idea of hanging bike rack. 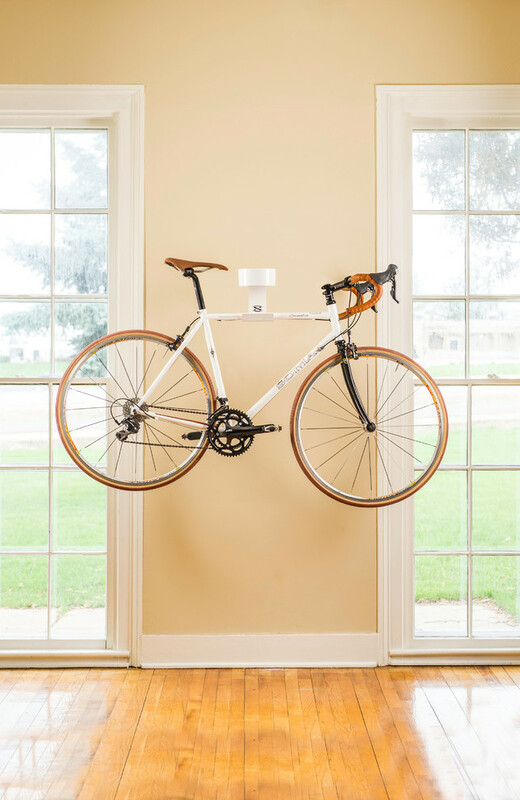 This bike is purely a wall ornament, not functionally usable. The red color gives opposite tone to its background wall, green. Both colors are completely contrasting yet quite interesting. A cluster of light-bulbs adds a dramatic look in this space. Wall bike racks break the clean line bedroom – by contrast, they bring the uniqueness in this room. Why unique? Most people probably say ‘there is something floating in this space. This proves us that the bike racks have successfully attracted people’s interest. 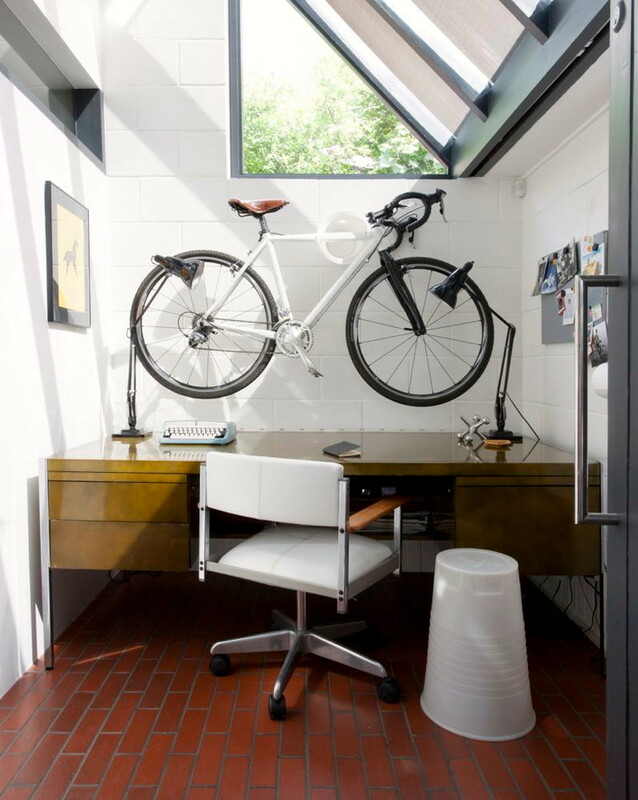 Give an accent of bike shed in the center of your favorite space. In this home library, for instance, turns to be more stylish and unique with such a creative bike shed. Here, we’ve discovered that the uniqueness is created when we put something totally different with our biggest interest, or it comes to be unique if we put our two biggest interests side by side. Yes, it’s common to put our racing bike in a kickstand placed in the gym room. This place is the most ideal spot for keeping the bike. 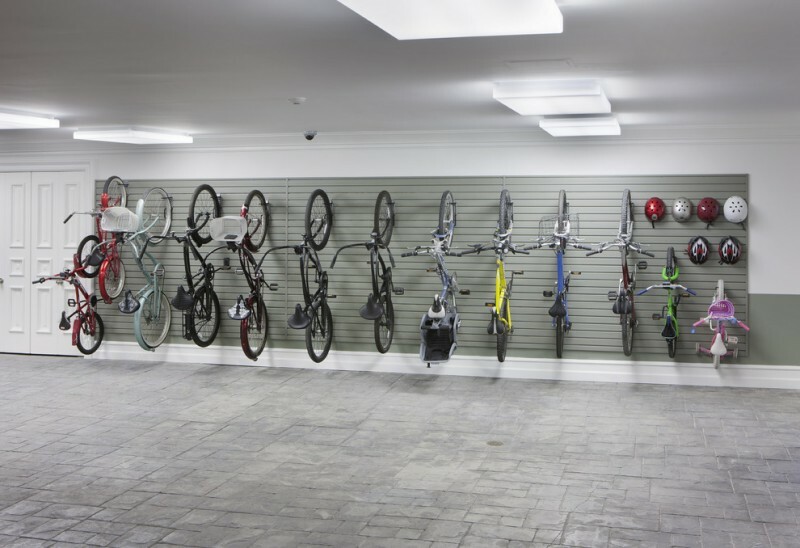 The bike and gym equipment can be put nearby, so we can easily access one of them in instant. 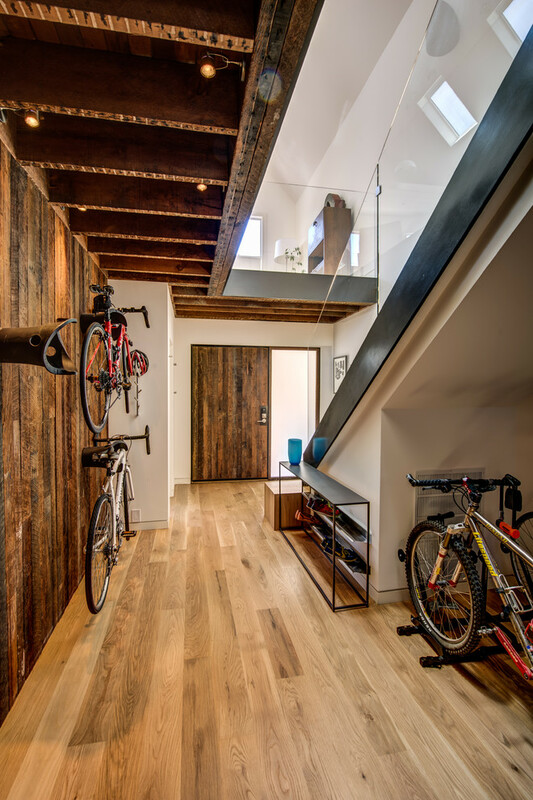 This entry way is the ideal space for keeping a bike. To make it more attractive, add pops of color to this white and clean line space. The best decor idea concerns on aesthetic and functional values. Like this boys’ bedroom decor idea. 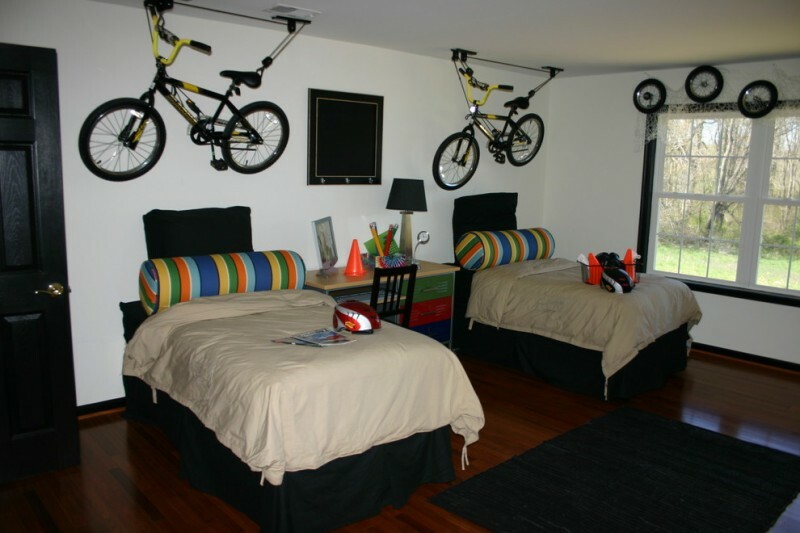 The idea is quite adorable, using boys’ hanging bikes as the decor. 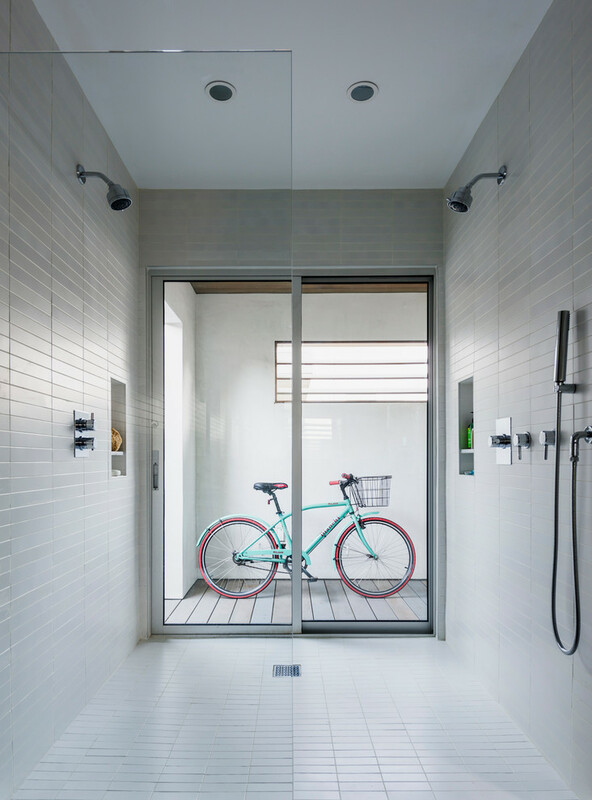 A couple of hanging bikes in modern minimalist hallway. Their colors actually colorize the room which is dominated by white. White interior here helps the bikes so stunning, so this idea is really good choice for you guys who want to add an accent or decoration in instant way. 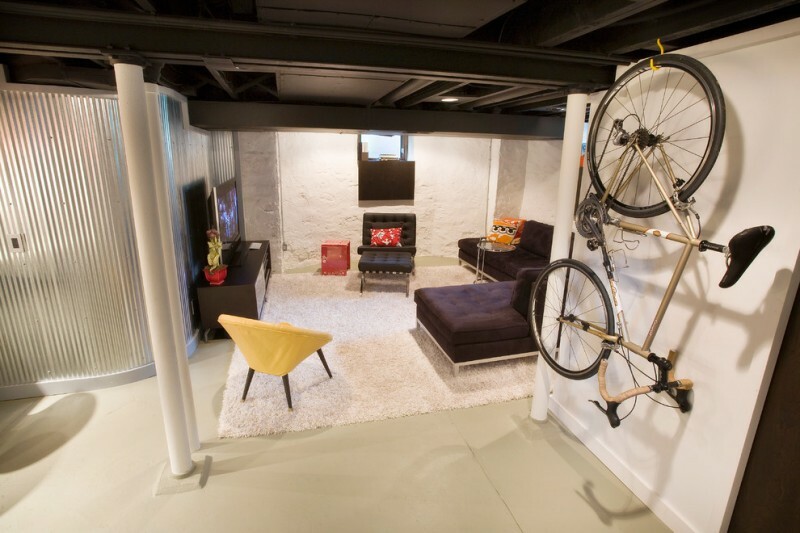 Up-side-down bike decor fills the basement living room. 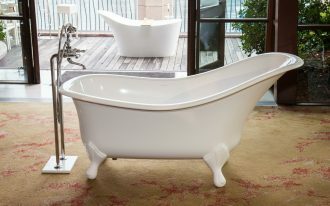 Its existence gives a distinctive beauty in room. 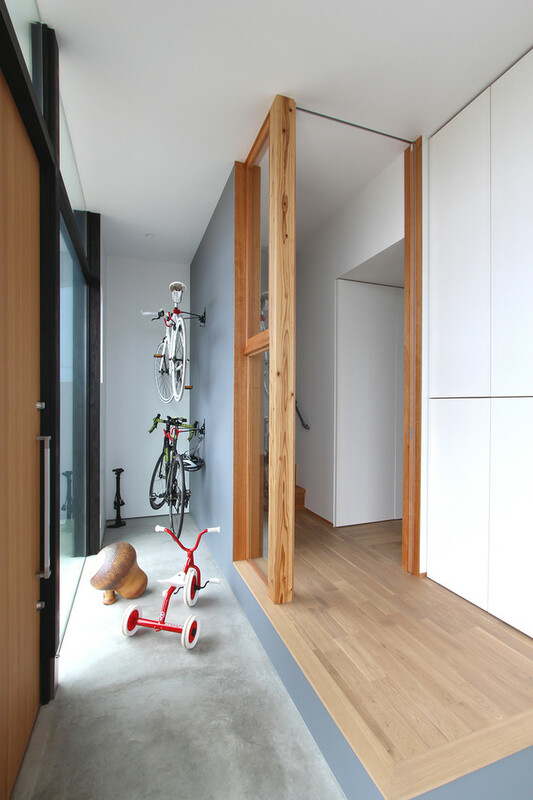 A narrow hallway accented with a mini bike shed at the corner. This idea is valuable to solve the limited space. 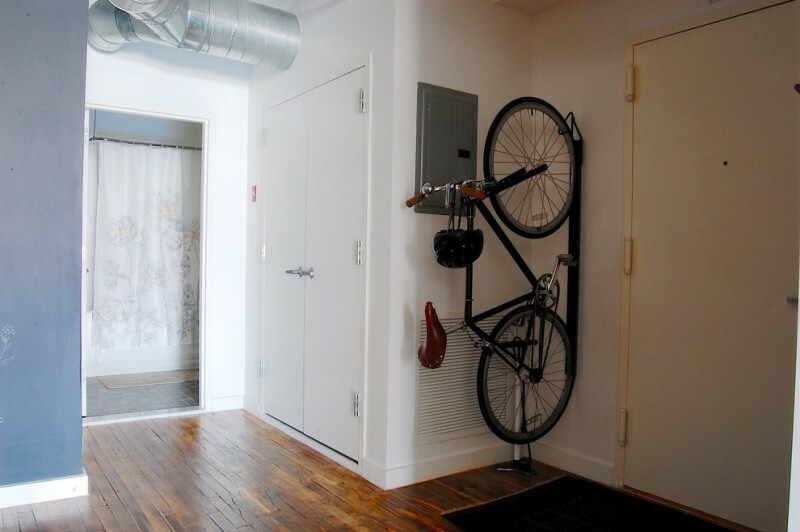 Here, the hallway is functioned as an alternative of bike shed as well as the decorative bike display. 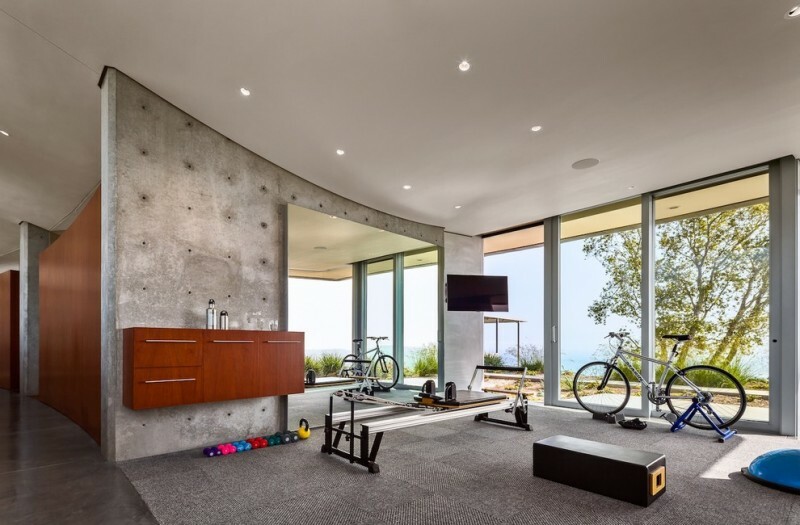 Minimalist home gym idea with concrete floors & walls and clean lines furniture sets. 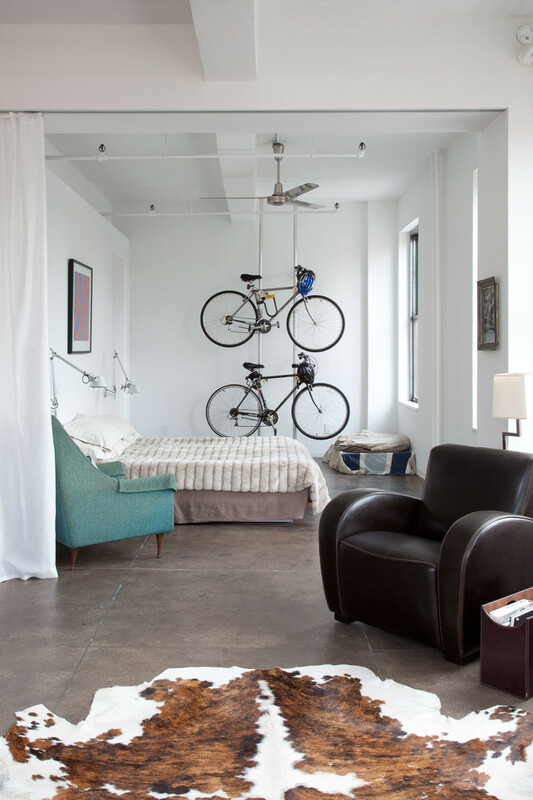 Here, we’ve found a kickstand for bike, adding sporty look in this room. 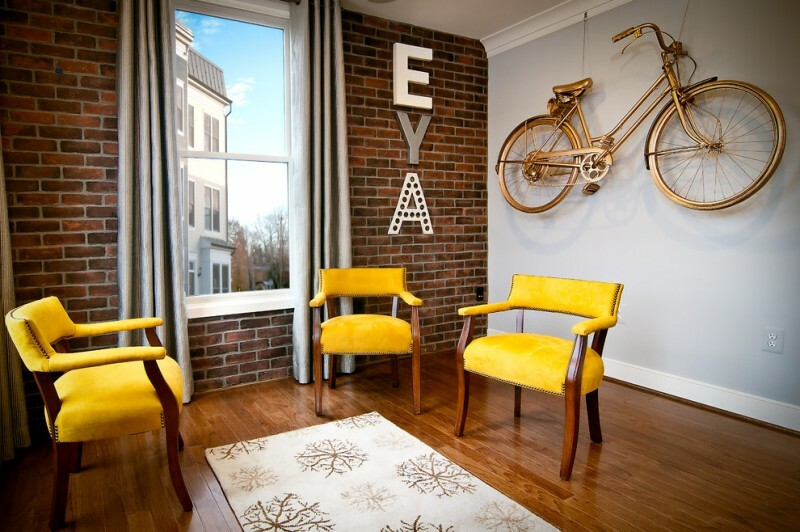 It will be great if you involve a unique wall decor like this wall bike decor in your eat-kitchen. The decor, of course, will give ‘different’ beauty in this ‘busy’ room. 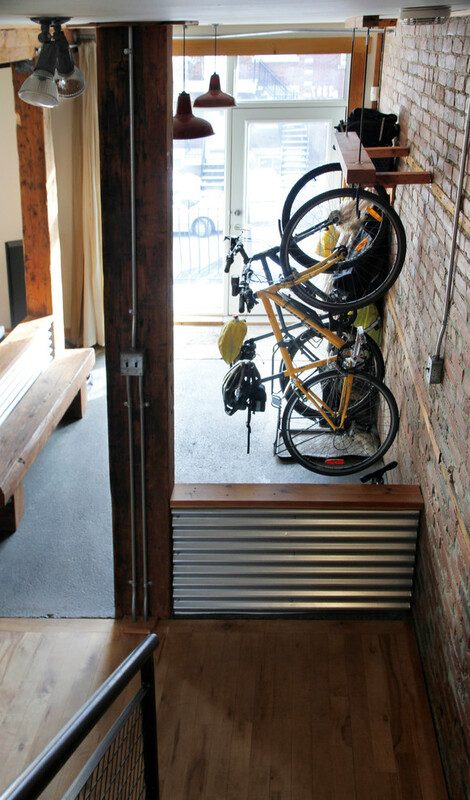 An urban style bike storage idea – it’s simple yet elegant. 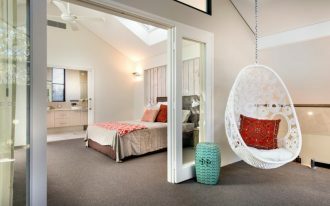 It simply plays its role as the room’s decor as well as functional item. Notice the colors; they balance each other. Urban style is popular right now. This room, for instance, looks so elegant and modern with such a simple wall decor over fireplace. The bike storage is installed higher to get a maximum look. 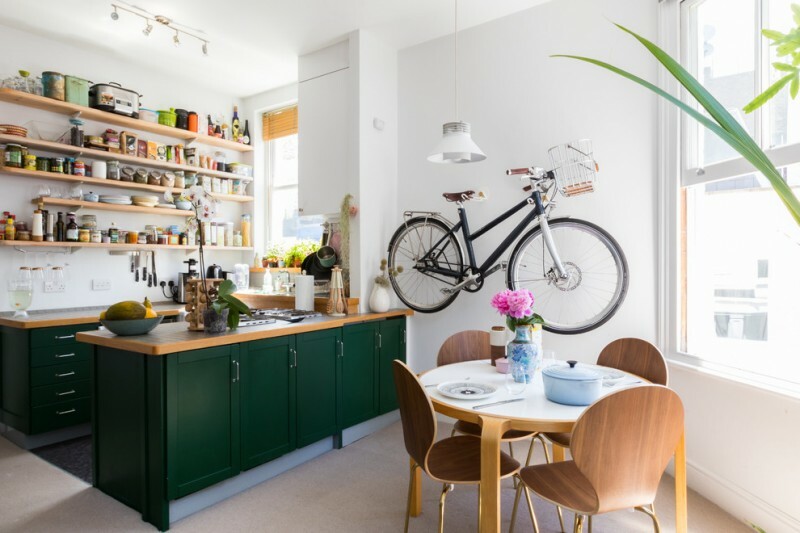 One of apartment characteristics is the main room has a role for multiple functions (as a living room, dining room, kitchen, and even bike storage space). 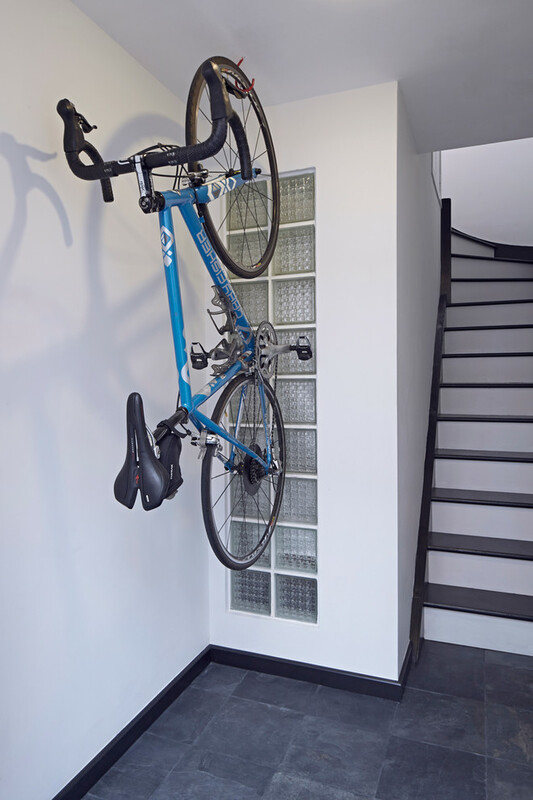 To save the space, a wall bike rack is the best solution for storing the bike. 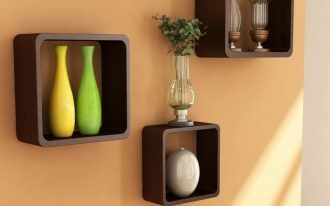 It can also be an attractive display in your room. 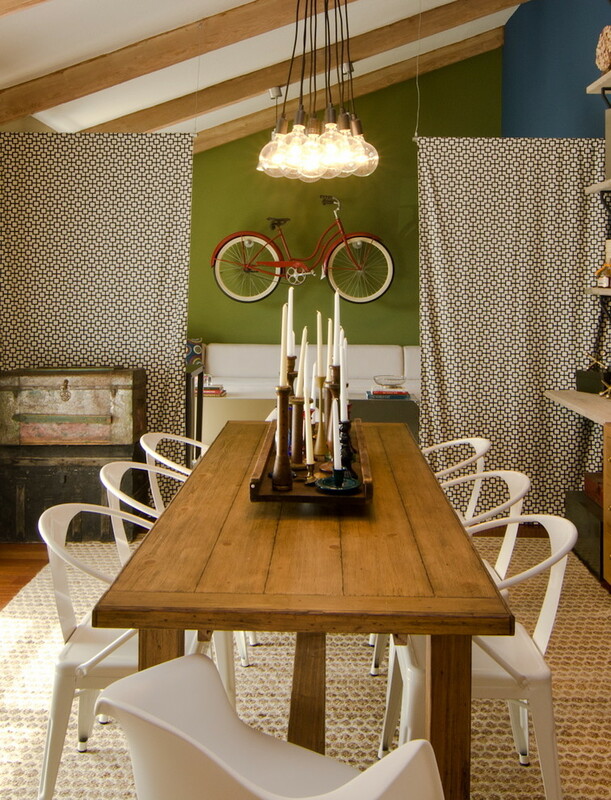 An inspiring large & modern boys’ room with dark wood floors and blue walls accented with blue-turquoise hanging bike. 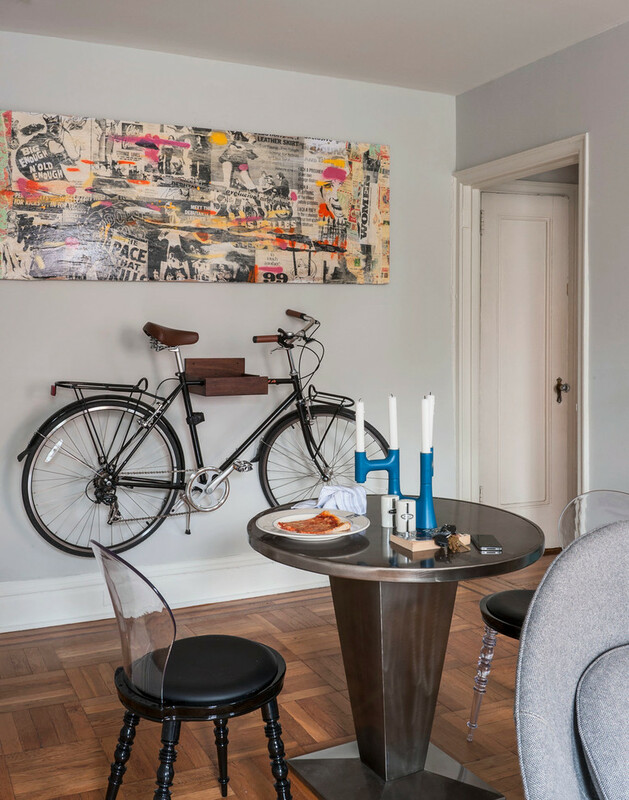 Please take a note: the hanging bike is just a wall decor. The feminine bike is just a sweet maker. It elegantly gives a classic touch to this mid century modern living room.